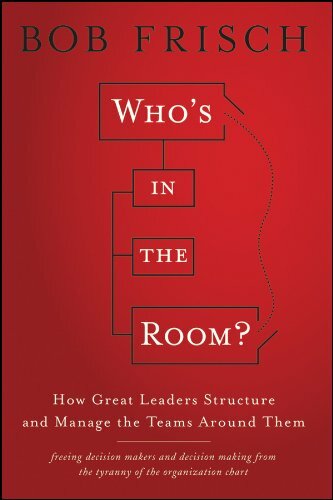 The jacket copy and most of the press coverage of this book focus on Bob Frisch’s debunking of the Big Myth of business management: that Senior Management Teams actually run their companies. But this is like reviews of birthday cakes focusing on the icing or the decorations. Sure, those are parts of the cake, but only parts, and for many of us they are far less important than the quality and taste of the cake itself. The guts of this book actually focus on how to run a big company most effectively. To make those points, Mr. Frisch does debunk the Big Myth. He then goes on to explain how and why most corporate leaders operate: first by assembling ad hoc teams of trusted advisors who have expertise on the particular problem at hand, and then by listening to their advice. So far, it’s all a no-brainer for anyone who has logged sufficient time within any of today’s giant organizations. But from there Mr. Frisch takes off in some fresh, relatively unexplored directions. Item: Mr. Frisch asserts that “kitchen cabinets”—the term for a boss’ informal advisory teams—are not only a fact of life, but an appropriate and effective mechanism for making good organizational decisions. He gives some pointed suggestions for assembling these teams with the right mix of people so they can move quickly, with candor and confidentiality, toward sensible decisions. •	Allow the team to make the final decision. Although Mr. Frisch concedes that most leaders have a marked preference for one or another of these styles, he believes that each decision is best made using the appropriate style, and offers a hint (which I would have preferred him to more fully flesh out) about how best to select the right style for a given decision. 1. Members are torn between their functional expertise and the pressure to think about the good of the whole organization. 2. Each member is more accountable to a specific, disparate constituency than to the organization as a whole. 3. There are invariably conflicts about where the balance of power lies within the team. 4. The team’s process (the “voting paradox”) inherently creates conflicts and reduces the chance of consensus. Mr. Frisch hits his stride when he begins writing about the best ways to make decisions, and advocates that each leader tailor his decision making structure to combine both personal needs and the type of decision under deliberation. He offers helpful suggestions about decision making best practices, including the right number of advisory teams to be organized, the most effective size and composition of each team, considerations of “issue ownership” as each decision evolves toward final disposition, and even the timing of the various tasks involved. 1. Where we should go? 3. How do we best manage available resources to ensure the success of all we are trying to do? Mr. Frisch also claims that members of the Senior Management Team are best suited to evaluate the organization’s “walls and fences.” For Mr. Frisch, “walls” define areas where the organization should not go, while “fences” describe boundaries that are temporary, and eminently movable when necessary. Bob Frisch argues that many organizations frequently mistake one for the other, and that only Senior Management Teams are properly positioned to evaluate their organizations’ currently perceived walls and fences, and to re-label them more accurately. In the end, Mr. Frisch’s advice is to stop pretending that Senior Management Teams are the organization’s ultimate decision makers, and instead to charge them with analyzing the decisions that have already been made and determining how they can best be implemented. And ultimately, isn’t that what you really want from a book on organizational decision making and leadership?